It's 2013 now. Mmosale have been engaged in providing MMORPG service since 2005, we make great effort to help players gain much more enjoyment, and we are also always reliable, professional and the best with highly reputation. We can't make such great achievement without support from your guys, so it's time for return now. So here comes our first big promotion of this year! Discounts are prepared for you. Started from Feb 23, 2013, our February's Promotion will last for 9 days. 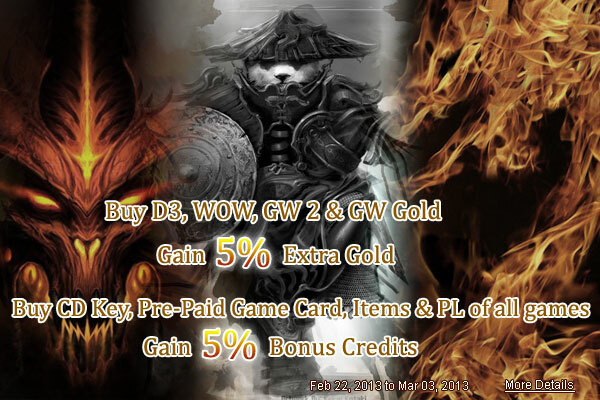 Extra free gold, discounted CD Key and game cards, power leveling and game items on sale. Are you ready for them? Buy Game Gold, Get 5% Extra Free! Make a gold order of Diablo 3, World of Warcraft EU & US, Guild Wars 2 or Guild Wars, you will get an extra of 5% of your order's amount. Orders paid with bonus store credit will also get the 5% extra free. Extra gift comes with our cheap CD Key and pre-paid game cards. Buy any CD Key or time card on our site, you will gain extra 5% Bonus Store Credit in your mmosale account instantly after your order is processed. Power Leveling and Game Items Orders As Well! Same great deal for power leveling and game item orders! 5% Bonus Store Credit will also be yours if you place an order of our power leveling service or game items. Our February's Promotion will end on Mar 3, 2013. Why still wait? Move now! Make sure to get yourself a big discount before the expire date.